From Hurghada you can reach the famous wrecks of the North - the Thistlegorm, Ghiannis D, Carnatic, Ulysses, Rosalie Moeller and others. It is also close to the protected Giftun Island Marine Park and many reefs. For more info see the wreck diving page. The area is well looked after thanks to the Hurghada Environmental Protection and Conservation Association (HEPCA). They have, for instance, installed a boat mooring system to protect the reefs and wrecks from boat anchors. Hurghada is located just below the Sinai peninsula. Until the early '80s it was a small fishing village but has grown to become a large resort town. You can fly directly to Hurghada from many European countries. The sea temperature ranges from 21 oC in February to around 28 oC in August. The weather gets very warm between June and August, with temperatures over 35 oC . There are plenty of ATMs in Hurghada so getting money out is no problem. Red Sea Reef, Photo credit: Tim Nicholson. Some people are nervous of going to Egypt at the moment because of the risk of terrorism. However, enhanced security measures are in place to protect the Sharm el Sheikh and Hurghada resort areas. Security forces are situated at the international airports, at check points around the perimeter of the towns and throughout the Governorates. Routine security checks are being performed on entry into the airport and the police are carrying out vehicle checks in the towns. See the Egypt Foreign Travel Advice page for more details. You are always advised to take out comprehensive travel and medical insurance before you travel. Tourists need a visa to visit Egypt. You can get this on arrival by payment in Sterling, US Dollars or Euros. The cost is US$25 at approved bank kiosks within airport arrival halls, before reaching immigration. There's no need to buy a visa from an agent who often charge more than the US$25 for the visa. (Note: if travelling just to Sharm el Sheikh, Dahab, Nuweiba or Taba resorts you don't need to buy a visa, but for Hurghada you do.) Your passport should be valid for a minimum period of 6 months from the date of entry into Egypt. Carless Reef is around 14 km north east of Hurghada, between Shaab Umm Qamar and Giftun island. It is 200 m long with the reef top being at just a couple of metres. Expect to see giant moray eels and white tip reef sharks. The reef has two pinnacles at 12 m.
"Nice reef with a lagoon. Easy, many fish. " "A place for everybody, shallow or deeper dives are possible.A lot of things to see and with some lucky dolphins. " You can dive the east or west side of El Fanus. It is also known as dolphin reef as you often see bottle nose dolphins here. Lot of dolphins and turtles. The Giftun islands are opposite Hurghada. They have been a marine protectorate since 1986 and divers need to pay 20L.E (Egyptian pounds) to go there. This money goes to maintaining the national parks. There are restrictions on how many boats are allowed. Nice easy drift dive with lots to see en route. Red Sea Diver, Photo credit: Tim Nicholson. Off the northern end of Giftun island. "You'll see turtles, eagle rays, octopus,lion fish, trumpet fish, rays...here you will see everything; and just off the coast too! " "Plateau in 10 -12m depth. A lot of pinacles full with corals and colorful fishes. " Plentitude of different fishes and corals. A coral plateau and a lovely wall with coral and gorgonia. A small island east of Hurghada. Another place to see giant morays. A sandy slope leads to a coral wall. This is 15 km south east of Hurghada. "Shallow reef with strong current. Beautiful corals and much fish, two Napoleons. " Abu Hashish means "Father of Grass" - named for the seagrass beds in the area. Swim down a sandy slope at the base of which you will meet a wall, along which you can often make a drift dive. Many fire corals - unusually in different orientations, some facing reef and some perpendicular. Eight foot wide gorgonian. Loads of life to look at. The island at the north east end of the reef. 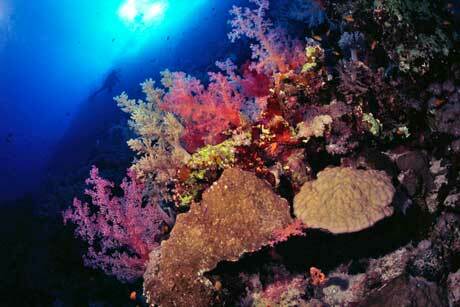 "Beautiful corals, much fish. Small reef shark sleeping in a cave. " "Beautiful wall dive with intact coral and lots of reef life. Beautiful scenery wherever you look. It's really worth it to go diving in Egypt! " 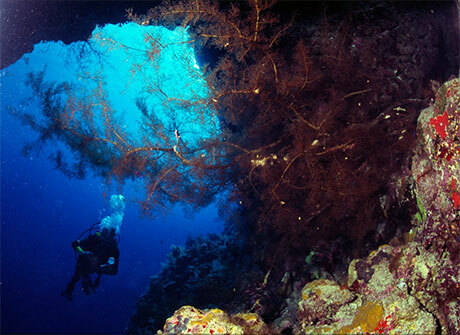 "Only steps away from the Diveshop of PDL lies this fantastic dive site. Located in Makadi Bay, close to Hughada this spot offers you Wall dive, slopes, sandy patches and seaweed meadows. 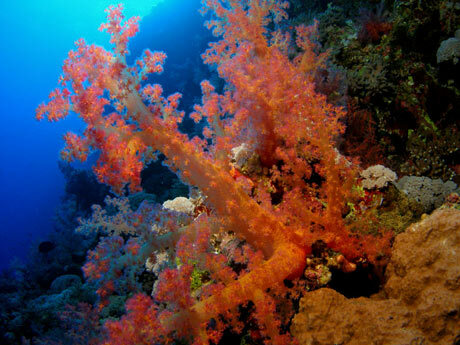 Like in most places in the red sea, the abundance and variety of coral is incredible! having occasional Big stuff like eagle rays, with a good eye one can also spot the small stuff between the corals. Great place to hang out and enjoy the beauty of the seas. " Here are three useful books to take on your trip. A great little guide and money well spent if you are going to Hurghada. Read our review. Note: If you buy any book through one of these links, the SCUBA Travel site earns a commission (at no extra cost to yourself). Thank you for making your purchases from here and helping to support this site.